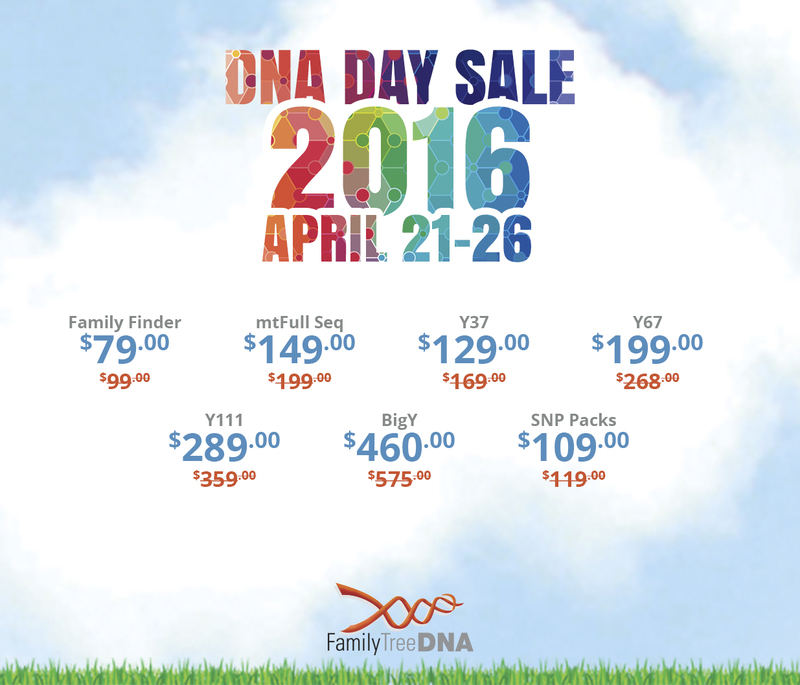 In honor of DNA Day, both AncestryDNA and Family Tree DNA are offering discounts on their DNA kits. The sales have already started and will go until April 26. Family Tree DNA's autosomal DNA Family Finder test is only $79 ($20 off) and the Y-67 test is only $199 ($69 off). If you have been holding off on Y-DNA testing, now is a great time to do it. Also, if you have older family members that have not yet been tested at FTDNA, you may want to take the opportunity to purchase Family Finder in order to get their DNA into storage for future testing. FTDNA is the only company that guarantees access to our stored samples for future testing (although they cannot guarantee it will be viable). Upgrades on existing tests will go on sale in June, so if you already have a Y-DNA or mtDNA test and want to upgrade to a higher resolution, you will have an opportunity to do so then. For those of you considering a Y-DNA test, you may want to start with Y-37 (on sale for $129) and see what you get as far as matches. Then, if your results are back in time and you need to narrow it down further, you could upgrade to Y-67 during the later sale. Click here to order. AncestryDNA's kit is now $79 ($20 off) plus free shipping (use code FREESHIPDNA). With the free shipping, this is an especially good deal! Ancestry's database is huge now (well over 1.5 million!) and growing fast, so do not miss out on all you could discover by testing there. If you are ordering multiple kits, you may want to do so separately to take full advantage of the free shipping (works for only one kit per order). Click here to order. AncestryDNA is also on sale for Canadians - $109 CAD plus $20 shipping ($40 off). Click here to order. **Update - 23andMe just sent me an email for $50 off up to three tests ($149 each) for Mother's Day, good through May 8th. This is apparently a targeted sale, so check your email to see if you received one. Enjoy and best of luck on your research! Hi, You can't order a kit from that site with a US address. The US sales are strictly controlled due to the FDA restrictions on the type of results that can be reported. International orders receive more health results than domestic ones. FYI You cannot get Free shipping on Ancestry dna test. Lady checked with several persons and they said no so I kept the one I had already ordered but didn't buy more. Will order as needed. When the sale first started you were able to get free shipping, but they must have disabled the ability. I found that too. I wonder if you can only use FREESHIPDNA one time. I don't think that is it. They may have not intended to allow free shipping and they disabled it when they realized after a day or two.